Fluffy Vegan Buttermilk Biscuits w/ Cheddar & Black Pepper. Let’s talk biscuits. #biscuittalk. Does everyone love a biscuit? Because I think everyone loves a biscuit. Vegans biscuits though. Any vegan can throw down a drop biscuit with little to no trouble. 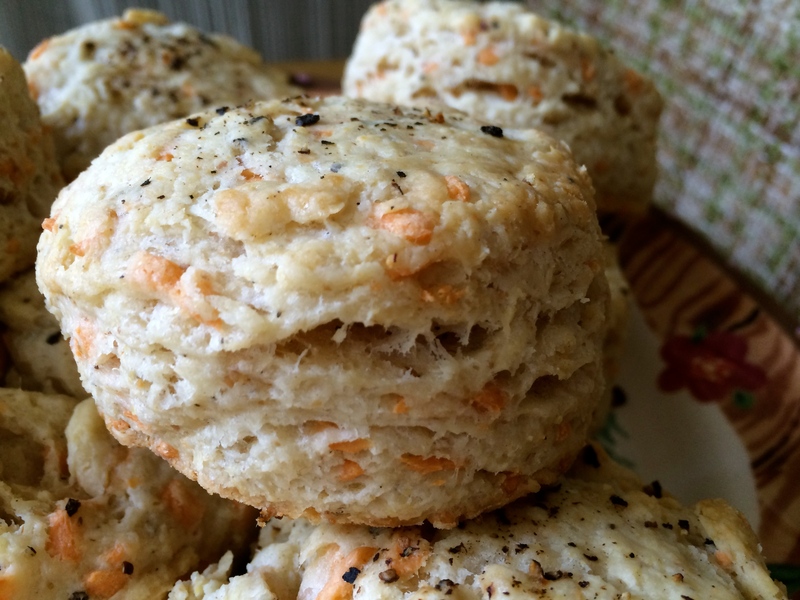 In fact, most dairy and egg laden drop biscuit recipes can be veganized in a snap with equal substitutions*. 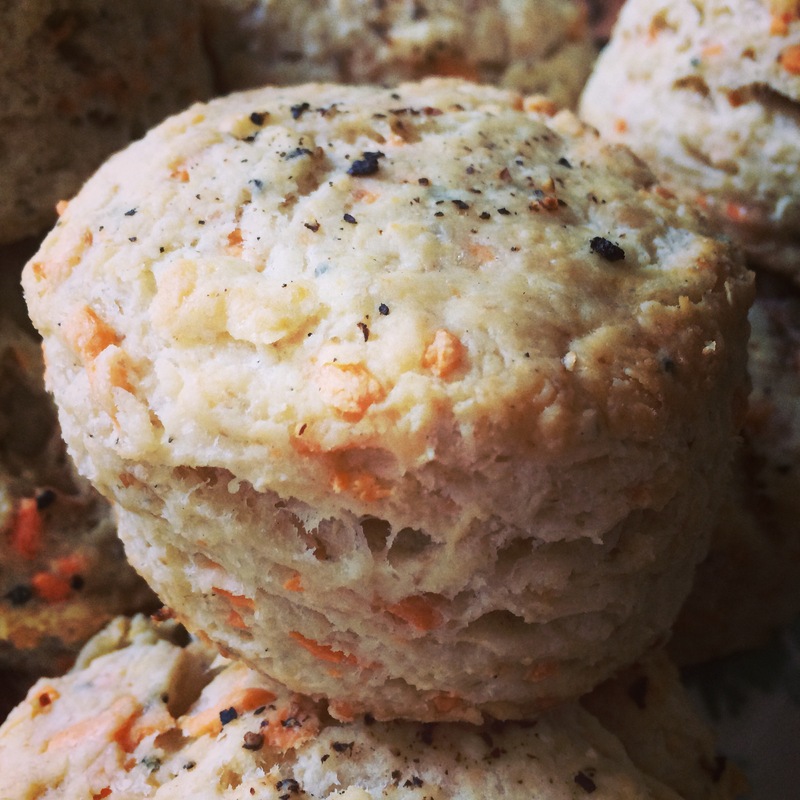 A buttermilk biscuit, however, is an entirely different business. For a good long while, a fluffy, flaky vegan buttermilk biscuit eluded me. 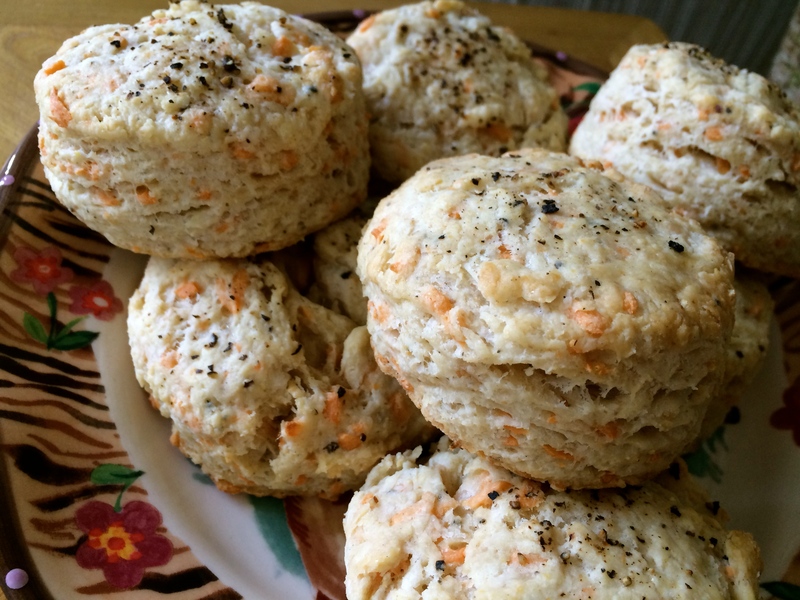 I tried a bunch of different recipes…both omnivorous and vegan, but nothing ever yielded the perfect biscuit. They generally tasted great, but were flat and not very flaky. Then, there was this biscuit recipe. Adapted from Joy the Baker, genius, I now have the ideal biscuit. It’s something everyone should know about, so here I am to share with you. 1. You should own biscuit cutters. I hate telling people how to live, but seriously, you want great biscuits? Get yerself a nice set of biscuit cutters. Make sure they’re sharp. This honestly does make a real difference as to how your biscuit will turn out. I used a turned over pint glass or cookie cutter and the results are not the same. 2. White Lily flour makes the best biscuits, but I have NO clue whether or not it’s bleached or ? Unbleached all-purpose will work well if you cannot find or don’t want to use White Lily. Preheat oven to 425°F. Prepare a baking sheet with parchment or a silpat. In a mixing bowl, combine the dry ingredients through the pinch of salt. Using a pastry cutter, cut in the fat (shortening & vegan butter). You’re going for coarse here, sort of like making pie crust. Add the Daiya shreds and pepper. In a separate small bowl, combine the vegan buttermilk and the flax egg. Add the wet ingredients to the fat/flour mixture and combine to form a dough. Keep cold almond milk on the ready and add it one tbsp at a time if your mix is at all dry. Give a few kneads. On a lightly floured surface, pat or roll the dough to about an inch. Use your biscuit cutter to cut out as many biscuits as possible. Re-roll or form the scraps to make more biscuits. Get as many as you can, they are really good 🙂 Place the cut biscuits on the baking sheet. Brush the top of each one with almond milk and sprinkle or crack some black pepper on to the tops. As much as you like. Bake for 15-20 min depending on your oven. They won’t golden like dairy/egg biscuits, so keep an eye on them. The edges will start to lightly golden and that’s how you know they are done. *Beware of salt content when making equal substitutions for butter and Earth Balance buttery spread. Most omnivorous/traditional recipes call for unsalted butter. Vegans do not have this option when using Earth Balance buttery spread as each version does contain salt. Just adjust the amount of salt called for. As a general rule, I like to cut out at least half the salt when veganizing a traditional recipe with Earth Balance buttery spread. Oh wow they look amazing! I am such a fiend for a good fluffy biscuit and I used to be able to ravage a basket of cheesy biscuits from Red Lobster. Definitely want to try these!! These look amazing. I love a bit of cheesy savoury baking!